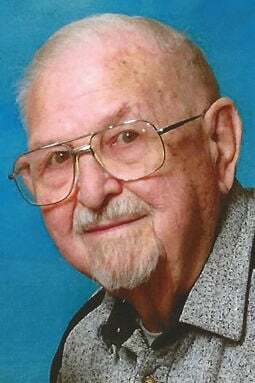 Anton R. “Tony” Kuntz, age 93, of Fremont died Saturday, March 30, 2019, in Fremont. He was born Nov. 23, 1925, to Roman and Rose (Binstock) Kuntz in Dickinson, North Dakota. Tony grew up at Dickinson and graduated from Dickinson College. He also lived at Bismarck, North Dakota, Red Wing, Minnesota, Norfolk and Fremont, Nebraska, Lebanon, Missouri, and back to Fremont. He served in the U.S. Army Air Corps from Feb. 4, 1946, to Aug. 3, 1947, during World War II. Tony married Theresa (Miklautsch) on April 11, 1950, in Dickinson. Theresa passed away on March 30, 2014. Tony worked at Wells Fargo from 1974 to 1979 and then worked as a Statistician for the Fremont Utilities Power Plant until retiring in 1996. Tony was a member of St. Patrick Catholic Church in Fremont, Fremont Knights of Columbus Council 1497, VFW Post 854, Fraternal Order of Eagles Aerie 200, all in Fremont. Former member of Fremont Rotary Club, Kiwanis and Toastmasters clubs. He was a former District Scout Executive for Boy Scouts of America for over 20 years. Survived by daughters, Suzan Johnson, Mary (Frank) Oshel and Pamela (Karl) Fryklind, all Fremont; brothers, Richard (Peg) Kuntz, Boise, Idaho, and Jim (Margaret) Kuntz, Bismarck; sister, MaryAnn Seiler, Dickinson; 10 grandchildren, Terri Ann Joy, Dean Johnson, Tiffani Broyles, Danielle Johnson, Boone, Daniel and Cody Oshel, Emily Cameron, TJ Fryklind and Shane Kuntz; and 14 great-grandchildren. Preceded in death by parents; wife, Theresa; son, Colin Kuntz; granddaughter, Kasie Oshel; sisters, Delores Barta and Pauline Splichal. The funeral Mass is 10 a.m. Friday, April 5, at St. Patrick Catholic Church in Fremont. Visitation is Thursday from 4-8 p.m. and family will receive friends from 5-7 p.m. and a Knights of Columbus Living Rosary will be at 7 p.m., all at Moser’s in Fremont. Visitation continues on Friday 1 hour prior to the Mass at church. Military honors will follow the Mass at church led by the Fremont Honor Guard. Interment will be at Calvary Cemetery in Fremont. Memorials to Archbishop Bergan Elementary School. Moser Memorial Chapel, 2170 N. Somers Ave., Fremont, NE 68025 402-721-4490.